Assassin’s Creed has long been subject to the trends on the peripheral of big budget action games. Black Flag had a companion app and progress-quickening bundles available on its store – but Unity won’t travel any deeper down the microtransaction hole. Assassin’s Creed Unity will allow players to “fast track” its unlock system by spending real money, just as Black Flag did. 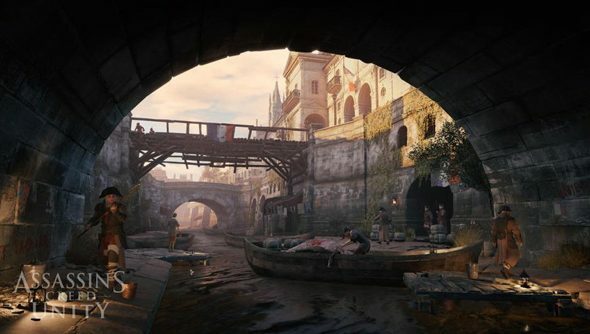 Senior producer Vincent Pontbriand told OXM that Ubisoft Montreal had to be “on the lookout for” new monetisation trends – but that unlock fast-tracking was “pretty much” as far as microtransactions would go. “Companion apps, monetisation, other business models, digital only… We have to be reactive to these things, but not necessarily fundamentally change what we’re trying to do,” he said. The companion app in Assassin’s Creed IV: Black Flag offered maps and an alternate route to its fleet minigame – and certainly didn’t prevent it from becoming one of the best games of last year. As for its paid unlocks: I didn’t notice them. Are you worried about the division of wealth in Unity?